Everglades Holiday Park is the perfect introduction to America's largest subtropical wetlands! Before climbing aboard an airboat, a professional group photo will be taken of you and your accompanying guests. This photo will be printed and framed for you to take home and memorialize your Everglades experience. 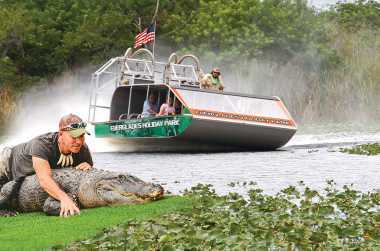 Climb aboard a state-of-the-art airboat and fly across the River of Grass on this tour into the Everglades.